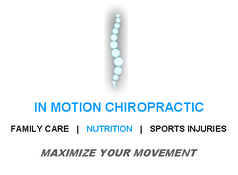 At In Motion Chiropractic, we take great pride in providing the finest chiropractic care to each and every patient. We have included information below about the different chiropractic services offered in our Westminster chiropractic office, but please call us at 303-254-6965 if you have any questions! We provide advanced spinal correction and chiropractic adjustments utilizing "state of the art" chiropractic techniques. Never in the history of chiropractic care have chiropractors been able to provide the level of help and expertise that is available today. Many of the newest chiropractic techniques are actually safer, more comfortable and more effective than ever before. As a chiropractor who cares about utilizing the most advanced chiropractic techniques, Dr. Lindsey Green has years of training, expertise and experience in helping patients get pain relief for back pain, neck pain, headaches, and other related conditions originating from the spine. Chiropractic care under a trained professional can even be used to prevent injuries and help you achieve total health or wellness. At In Motion Chiropractic, we teach our patients how to perform special "blueprint" exercises which can help strengthen and correct the irregularities in their body which may be causing pain. Many of these corrective exercises can actually be performed in the comfort of your own home to help improve the effectiveness of your chiropractic care and spinal correction plan. In addition to skeletal misalignment, you may be experiencing pain that is caused by muscles and connective tissues which are out of their proper place. Other types of pain such as back pain, neck pain, and headaches are caused by muscles and tissues that are being used improperly, causing injuries over time. In each case, targeted corrective exercises and stretches from our experienced chiropractor will help you feel good while also helping your body achieve balance and health. What does nutrition have to do with chiropractic care? The goal of chiropractic care is to help patients achieve total health and balance with their body, and as part of that goal we provide specific recommendations on nutritional supplements and healthy food choices. Nutritional counseling by our experienced chiropractic health professionals can assist a patient on their return to optimal health. Do you know which supplements and vitamins are good for you? Do you know how these supplements and vitamins interact with one another? At our Westminster chiropractic clinic, we can provide each patient with a structured nutritional program that is based on their individual needs. Whole body vibration has many benefits ranging from; increased muscle strength and flexibility, better range of motion, better core conditioning and stability, faster recovery and regeneration; to increased metabolism, blood circulation and bone mineral density. Due to its many benefits, whole body vibration has quickly gained acceptance and is now being utilized by professional and university sports teams, and health professionals in the rehabilitation and medical fields. Reclaim your movement! Chances are your problem, lack of flexibility or range of motion could be caused by scar tissue adhesions. Scar Tissue occurs naturally in the body as a temporary patching mechanism for wounds caused by injury, surgery, trauma, or repetitive stress. When it spreads and connects tissue not normally connected, it can entrap nerves, limit your range of motion creating stress and tension. Rapid Release is the only device that targets these restrictive adhesions through resonant frequesncies, just like the opera singers voice can shatter a glass. Fast, noticeable results can be achieved in as little as 2-3 minutes. Rapis Release uses high speed vibration to penetrate deep into tissue targeting these adhesions releasing tension and tightness. If you look at a baby’s foot, you’ll notice their toes are splayed, strong and flexible, and that the widest part of their foot is at the ends of their toes. Adult feet are intended to display these same qualities. Many common foot, ankle, knee and low back problems can be eliminated and prevented by allowing your feet to function naturally, with toes that are splayed, straight and strong. Correct Toes are top quality toe spacers and can be worn barefoot or inside appropriate footwear while walking, running, standing and throughout your daily activities. Ask us more about the benefits of Correct Toes and if they may be right for you! There is a saying that an ounce of prevention is worth a pound of cure. Your spinal health is no exception. Posture and spinal screenings by a trained and experienced chiropractor such as Dr. Lindsey Green can help reveal important health information, unlocking the door to improved health and well-being. In order to help the Westminster community, we provide screenings at area malls, community events, health fairs and places of employment. Contact us today at 303-254-6965 to arrange a screening at your event or workplace.